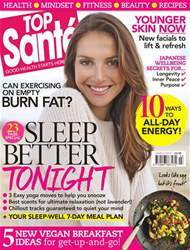 (1 Customer Reviews) | Write Review 13 issues per year Top Santé believes every woman has the ability to maximise her health and beauty at any age and regardless of health history. With a balanced diet, effective exercise and a positive mind-set, you can stay younger for longer, inside and out. We’ll bring you the latest information regarding wellbeing, fitness, food and beauty, empowering you to make informed choices. What’s gone before can’t be undone or redone, so leave it in the past and focus on what you can change today. Top Santé is here to help you to better health, one small step at a time. HEALTH: Easy ways to improve everything from gut, brain and joint health, to balancing your hormones. PSYCHOLOGY: Reduce stress, improve your sleep, tap in to inner calm to feel happier and more relaxed. FITNESS: Learn how easy it can be to fit exercise into your day to feel energised and strong, toned and slim. BEAUTY: Discover the latest youth-boosting, anti-ageing skin, hair and body products to glow on the outside and stay younger for longer. FOOD & DRINK: Tuck in to healthy meals, snacks and smoothies with our simple recipes devised by expert nutritionists to keep you full, satisfied and radiating good health. Looking for Top Sante in print? Unfortunately pocketmags.com does not sell print copies of Top Sante, but all is not lost. Our partner at magazine.co.uk sells print subscriptions at the best prices online. 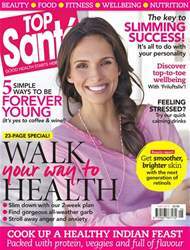 Top Santé believes every woman has the ability to maximise her health and beauty at any age and regardless of health history. With a balanced diet, effective exercise and a positive mind-set, you can stay younger for longer, inside and out. You'll receive 13 issues during a 1 year Top Sante magazine subscription. I just love it!There is everything in that magazine that i am interested in!My favorite!!!Reccomend! 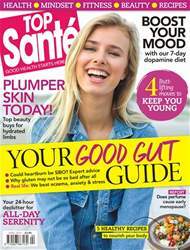 You'll receive 13 issues during a 1 year Top Sante magazine print subscription.